Honoring the life you want–it is not about the amount, but what is going to make you happy. 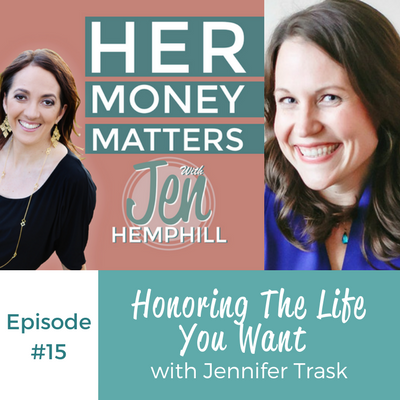 Those were some beautiful words said during the interview by my latest guest Jennifer Trask. She grew up having a healthy relationship with money, but had to learn some hard financial lessons along the way. Jennifer T. was never taught how to budget neither at home nor at school. Not only did she figure it out on her own but she has created a business that she takes with her while traveling the world! Finish the sentence and post on Twitter or Instagram with the hashtag #HerMoney for the remainder of September. This will be your entry to win a 15 minute personal Q&A session with me! I will announce a winner on the 1st episode of October.